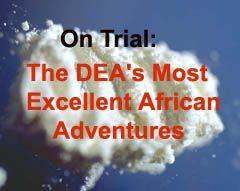 I've been writing for over a year about what I call the DEA's African Vacations. Shorter version: DEA agents go to Africa, set up an elaborate sting, whereby cocaine from South America is flown to Ghana or elsewhere in Africa, so that it can be transported to Europe, its final destination. Even though the cocaine isn't headed to the U.S., the feds in the U.S. indict the participants, have them arrested/kidnapped in Africa and fly them to the U.S. to stand trial on charges ranging from conspiracy to provide material support to a terrorist organization and conspiracy to commit narco-terrorism, to conspiracy to distribute or import drugs. The DEA wasn't done having fun in Africa after the Issa romp. It tweaked the next sting (in May, 2010), by having its informant inform this next group of participants that he intended to have his portion of the cocaine proceeds flown to the U.S. in diplomatic pouches. Result: an added layer of protection against a claim of lack of jurisdiction and manufactured jurisdiction. And it worked. The Court denied this group's motion to dismiss because some of the cocaine (even though not their portions) was going to come to the U.S.
[W]hile police brutality or other misconduct may lead to suppression of a defendant's statements or other evidence garnered thereby, it does not lead to the dismissal of the Indictment. As to the abduction claim, even assuming arguendo that Yaroshenko's removal violated various laws and treaties and thus was the equivalent of an illegal, forcible abduction, the Supreme Court has flatly held that "the power of a court to try a person for [aJ crime is not impaired by the fact that he had been brought within the court's jurisdiction by reason of a 'forcible abduction.'" Frisbie v. Collins, 342 U.S. 519, 522 (1952)..."
The essence of the charges is that defendants discussed air shipments of several tons of cocaine from Latin America to West Africa. (Indictment¶¶1-9). The only factual allegation connecting the alleged conspiracy to the United States is that the undercover DEA agent “CS” intended on his own behalf to send his share of cocaine to the United States. (Indictment ¶12®,12(s)). Upon information and belief, no cocaine was actually shipped anywhere. ...The Indictment in this case fails to set forth any facts connecting the alleged conspiracy to the United States, except for an allegation that the DEA agent CS intended, on his behalf, to transport drugs to the U.S. The sole purpose of that statement was to create the appearance of some nexus to the United States. The alleged object of the conspiracy was the transportation of drugs from Latin America to Africa and within Africa. The Indictment does not set forth any specific factual allegation that supports the conclusion that Konstantin Yaroshenko agreed to bring any drugs into the United States....Had Yaroshenko agreed to bring drugs to the U.S., the government would not have missed to include such fact in the Indictment...There is no factual allegation that Konstantin Yaroshenko either agreed to take any part in shipping the drugs to the United States nor concurred in such action. ...As this Court explained in United States v. Al Kassar, 582 F. Supp. 2d 488 (S.D.N.Y. 2008), "the Second Circuit has refused to dismiss indictments 'when there is any link between the federal element and a voluntary, affirmative act of the defendant. Thus, when confronted with situations in which (i) the [Government] introduces a federal element into a non-federal crime and (ii) the defendant then takes voluntary actions that implicate the federal element, federal jurisdiction has not been improperly manufactured.'" ...For example, the Indictment states that when "Yaroshenko agreed to supply the aircraft, pilots, and crew that were to be used for shipments of cocaine from South America to Liberia, Yaroshenko understood that from Liberia, portions of this cocaine would subsequently be imported into the United States. "...Without multiplying examples, the Indictment clearly charges instances where Yaroshenko took "voluntary actions that implicate the federal element[s]" of the charged crimes, which is enough for jurisdictional purposes. In short, the only connection to the United States was manufactured by one “Nabil”, a cooperating source with the Drug Enforcement Administration, who insisted that he get paid in cocaine to be trans-shipped from Liberia to Ghana and then to New York. Nabil’s insistence on being paid in cocaine to be sent to the United States had nothing to do with the charged conspiracy and was a blatant attempt on the part of the Drug Enforcement Administration agents to justify their involvement in this investigation, and to manufacture subject-matter jurisdiction, where none existed. Nabil, clearly acting as a government agent, entered into his own separate agreement with Kamara to route his payment to the United States. No cocaine was actually shipped to Ghana for later shipment to the United States. The Government in these cases does not dispute that the only connection to the U.S. is that the DEA informant asked that after the group finishes its business of shipping drugs from South America to Liberia to Ghana, that his portion of drugs be shipped from Ghana to the U.S. It argues there's nothing wrong with the DEA's practice and it's what Congress intended. With pre-trial motions decided against pilot Yaroshenko and his codefendants, trial begins Monday in the Southern District of New York before Judge Jed Rakoff. The case is U.S. v. Chigbo Peter Umeh, et. al. , Case No. 09 cr 00524. The defendants are Chigbo Peter Umeh, Jorge Salazar Castano, Konstantin Yaroshenko, Nathaniel French, Kudufia Mawuko, and Marcel Acevedo Sarmiento. Still at issue is a Government motion in limine to introduce evidence at trial from yet another South America-to-Africa operation involving a vessel called the Blue Atlantic. The defense claims its unrelated and prejudicial and the court has not yet ruled. How much of our money is the DEA spending on its African adventures? And how much are we spending to fly these sting targets from Africa to the U.S., hold them for a year or more in pre-trial detention, fund their defense, try them, incarcerate them for decades, and then fly them back when they are deported after their sentences? Considering unless the DEA demands otherwise, the (illusory) drugs are going from South America to Africa to Europe, why is it even their business to intervene? Or to steer non-U.S. criminal activity into the U.S.? I'd bet that if you told every American how much money Congress has authorized the DEA to spend on stings designed to stop drugs being shipped from South America to Africa to Europe, and then to fly those arrested to the U.S. for trial and how much we'll be paying for their years of incarceration, you could fit all those who approved on the head of a pin. All of the Wikileaks cables on the DEA and African drug trade are accessible here. Also recommended: From the New York Times, Cables Portray Expanded Reach of Drug Agency. since when does the DEA have any kind of jurisdiction in foreign countries? these are crimes that allegedly occured outside the US, absent those countries having given the DEA agents authorization to act, what are they even doing there in the first place? the judge seems to have conveniently glossed right over that (not so) small matter. talk about being "the world's policemen". are these DEA efforts costing? Not where I think budget monies should be allocated. The D.E.A. now has 83 offices in 63 countries. In 2007 alone, the D.E.A. opened new bureaus in Tajikistan, Kyrgyzstan and Dubai, United Arab Emirates, as well as in three Mexican cities. Here's the 2011 National Drug Control Budget. Scroll down to the international section. The FY 2012 Budget requests over $2.1 billion to provide international support, a decrease of $456.6 million (17.6%) from the FY 2010 enacted level. The Departments of Defense, Justice, and State perform a wide range of drug-control activities primarily focused on or conducted in areas outside of the United States. These programs help facilitate the disruption or dismantlement of the most significant international drug organizations, and increase the demand reduction and drug enforcement capabilities of partner nations. Major changes are highlighted below. The Administration proposes $12.5 billion for the Department's law enforcement components--the FBI, DEA, ATF, and U.S. Marshals. These agencies conduct investigations that, at later stages of the criminal justice system, lead to cases presented for prosecutions and convictions that result in incarceration. increase in budget? Over $15 billion? My goodness. Lots of 99ers on their last gasp of unemployment not being helped. Lots of people being pitched out of their houses for lack of assistance. Lots of hospitals, schools, roads, etc. not being built. Lotta oldsters not getting their meds. Oh, yes, just think what we could do with that 15 billion...and what we're NOT doing with it. And that's on top of the 40 billion wasted annually on this farce. must be here...the DEA is now the IDEA...International Drug Enforcement Agency...and what a terrible IDEA it is.